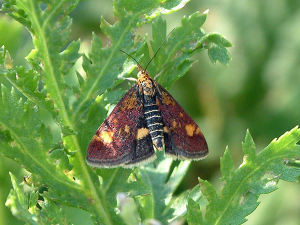 Observation - Mint Moth (Pyrausta aurata) - UK and Ireland. Description: Small (less than 2cm) deep red moth with gold markings. Found flying around (Spear?) Mint plants. Small (less than 2cm) deep red moth with gold markings. Found flying around (Spear?) Mint plants.